PLEASE NOTE NEW FORMAT CHANGES THIS YEAR: The 40th anniversary Summit features a one-day Trade Show, the America's Best Competition and specialized professional development training throughout the week. Call us at 800-989-6278 or visit our website at www.napt.org for more information. Have a HODINI on your hands? Discover how MAX stops your escape artist – Right Now! E-Z-On Products ensures a safer bus ride and protects the lives of children. See Products Here. Learn more about E-Z-ON PRODUCTS – they are made in the USA! E-Z-ON PRODUCTS President, Constance Murray RN is speaking at the Maine CPS Conference. Connect with those that care about school bus safety: Like E-Z-On on Facebook! Click here to read statement from U.S. DOT Secretary. Ed-tech remains critical to K-12 education, especially when it comes to student success and engagement. A survey of public school teachers and administrators sheds light on why and how ed-tech implementation isn't reaching its full potential. Ed-tech increases student engagement in learning, and 96 percent of surveyed teachers agree with this. When students are engaged in their learning, they learn more naturally and willingly, meaning that lessons have a real impact. Stronger WC18 Wheelchair Securements Needed! The revised standard dictates that wheelchair tie-downs must be stronger. WC19 wheelchairs feature lap belts that are integrally mounted onto the wheelchair frame. During a collision, this new dynamic produces higher loading on the WTORS as much as 60%. The QRT-360 is the first retractor to meet these new requirements. CrossingGuard monitors and enforces traffic around a stopped school bus, helping school districts to safeguard children traveling to and from school. Unlike other systems CrossingGuard requires no driver intervention allowing bus drivers to focus their attention on what’s most important. For more information visit www.ATSCrossingGuard.com. Is bullying getting worse? Studies show that more children and parents are reporting bullying, but even more concerning is higher rates of children surveyed anonymously say they don't report bullying. The most concerning trend is that children involved in bullying are more likely than ever to commit suicide. Children are, as a group, probably no meaner now than in generations past. So what is the problem? Access. One of the immediate challenges facing Kuna School District officials after a recent fatal crash was getting students back on district buses. "There was a lot of resistance" from nervous children, said Melanie DeLashmutt, the district's human resources director. During the first two days of class this past week, the district arranged for teams of therapy dogs and handlers to visit Crimson Point's sixth-grade classrooms to help grieving students. "A lot of the kids had been sad, and there's no way you can be sad around a dog," said handler Julie Bender of Nampa, a member of Therapy Dog Inc. "It begins the healing process." Distracted driving is a dangerous habit thousands of Americans do every day. Dr. Manbir Sodhi, with the help of his engineering students at URI, has been studying distracted driving for years. The equipment used to track distracted driving is more high tech than when he started his research in 1999. The engineering students at URI can track distracted driving in a blink of an eye. "The effects of distractions to some extent are your range of eye movements become much narrower," said Dr. Sodhi. Looking for similar articles? Search here, keyword(s): Science behind distractions. Suddenly, we are back in the holiday-season mode and getting ready to say hello to another new year. But before we break into cacophonous versions of "Auld Lang Syne," let's make sure we finish strong in 2013. Nearly 10 percent of all K-12 teachers and students will have a mobile device by 2017, according to a new report from Futuresource Consulting. In 2012, just three percent of K-12 teachers and students owned mobile devices, according to the company. Teenagers aren't the only ones that could use a lecture about texting while driving. New research shows more adults use their phones while driving than teens. The Alabama Department of Education is open to considering the idea that city school districts can charge students fees to ride a bus to and from school, the No. 2 official in the department said. However, both state and federal officials said they have concerns about school bus fees and whether they would adversely impact lower-income or minority students. Historically, state education officials have taken the position that school bus fees were prohibited for regular transportation to and from school. Developers at Pixelberry didn't know what to do when a player sent a message to the help line for their iOS game High School Story to say that she was contemplating taking her own life. "We were scared that we were going to say the wrong thing," said Oliver Miao, chief executive and c0-founder of Pixelberry. After calling the National Suicide Helpline for advice, the developers at Pixelberry kept the lines of communication open with the player for a week, telling her to seek professional help but also letting her know that they were listening. At the end of the week, the player said she would get professional help and told developers that the game was the reason she was still alive. Transporting Children With Disabilities, 4th Edition, by Dr. Linda F. Bluth, is available for purchase. NAPT members may purchase the Handbook for $14.99, plus shipping. The nonmember rate is $24.99, plus shipping. Transporting Children With Disabilities, 4th Edition contains useful definitions of transportation and related special education terms as well as characteristics of children with special needs and special considerations for transporting children with special needs. This popular publication also explains the legal basis for special needs transportation in accordance with the requirements of the Individuals with Disabilities Education Act 2004, Section 504 of the Rehabilitation Act, and the Americans with Disabilities Act Amendments Act of 2008 and contains information about new Family Educational Rights and Privacy Act regulations. To order your copy, please email NAPT Marketing and Communications Specialist Lynn Martin lynn.martin@napt.org today! To learn more about the new NAPT Special Needs Training program click here. 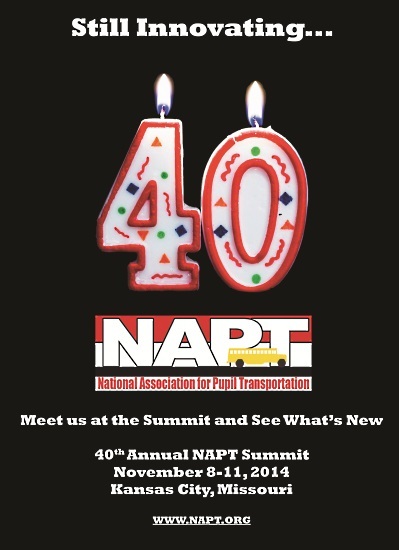 This edition of the NAPT MultiView News Brief was sent to ##Email##. To unsubscribe, click here. Did someone forward this edition to you? Subscribe here -- it's free!